When I started this series of articles on my new books of 2015 I’ve acquired I thought that I would do three or four of them, one covering the books I’d got around my birthday, another about now covering books I’d picked up over the summer and a final one in late December summarising where I’d got to. It never occured to me that despite being restrained in my book acquisition that I would have acquired 50 books by the end of August (and there are a few more on pre-order that I expect to arrive later this year). Anyway, there are 11 books in this instalment, bringing the running total to 49. I’ve read 18 hard copy books and have a few more that I’m part of the way through. At this stage I have to say that Im not confident that I will meet my resolution to read five more than I have acquired, this is because I’ve acquired more than three times what I had expected. one bought for 1689 Megagame research, and another sent in error for the first and not wanted back by the seller. The Shepherd’s Crown – Terry Pratchett is one of my favourite authors. I’ve already read and reviewed. Glencoe and the End of the Highland War by Paul Hopkins – bought as research for the 1689 megagame, it came as a recommendation from friends. The Great Highland Famine by T.M. Levine – this was sent in error when I ordered the Paul Hopkins book above. The bookseller didn’t want me to return it, so I’ve added it to the reading pile. I’ll be counting it as a present. 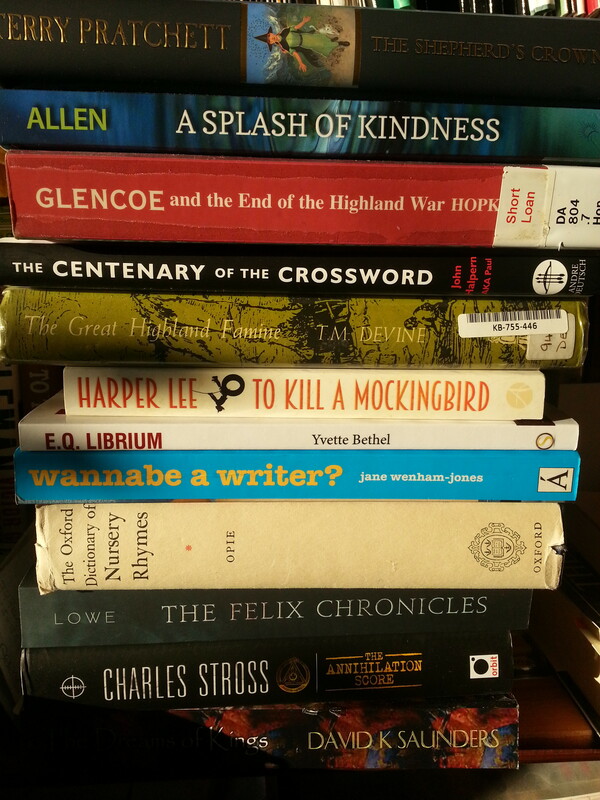 The Centenary of the Crossword – I met the author at Camp Bestival and went to a couple of sessions that he ran. He was a thoroughly nice bloke and spoke to me and my son when we bumped into him later on. This one I’m counting as a personal recommendation. To Kill A Mockingbird – my wife was surprised that I’d never read this, another personal recommendation. E.Q. Librium – an ARC that I agreed to review because it was about getting balance in your life. The review will be part of a general launch activity in early October. Wannabe a Writer – found in a charity shop. I’m a sucker for how to write books and this one is leavened with a heavy dose of humour (with a u). I’ve read some of it, but not enough to consider it read or to review it yet. The Oxford Dictionary of Nursery Rhymes – also found in a charity shop. I bought this as a reference work and also because I think it could be useful when writing urban fantasy, which I have some short story ideas for. I’m not sure I should count this towards the reading target as it isn’t that sort of book. The Felix Chronicles: Freshmen – an ARC that I thought looked interesting. It’s urban fantasy and it looked like it could be a gritty and interesting read. It is next but one on my reading list, so the review should be up in a couple of weeks or so. The Annihilation Score – Charles Stross is a favourite author and I buy all his stuff on pre-order. I really like the variety and his general world view. I’ve already read and reviewed this. Dreams of Kings – an ARC that I said yes to because I like well researched historical fiction and it looked like that. I’ve read about three quarters of it so far and I’ve been a little disappointed in places. It’s a good piece of fiction, just not the historical detail that I was expecting.